With the Affordable Care Act's emphasis on prevention, wider recognition of health disparities, and the demand for individuals and communities to connect to health resources, the need for public health social work has never been greater. Though it's not yet front and center as an area of specialty, public health social work—which stresses a socio-epidemiological approach to the prevention and management of health issues—is making forward strides in a movement that may have a deep and lasting impact on the health and wellness of Americans. While it hasn't been a well-traveled career path, public health social work "ultimately will emerge as a dominant model," predicts Betty J. Ruth, MSW, MPH, a clinical professor of human behavior in the social environment and director of the dual degree program in social work and public health at Boston University. "The main reason it's a minority practice at this time is that up until recently, a more narrow model of practice that focused exclusively on individuals held sway," she says. "For a variety of reasons, this is now shifting." As interest grows, educational institutions are ramping up to prepare social workers for careers in public health. According to Trina Salm Ward, PhD, MSW, an assistant professor and MSW/MPH dual degree program coordinator in the School of Social Work and the College of Public Health for the University of Georgia, "The number of MSW/MPH programs in the U.S. has increased from 20 in 2006 to 37 in 2013, with several more in the planning stages." Public health social work may be inching further into the spotlight, but it's nothing new. According to Jennifer Zelnick, MSW, ScD in public health, an associate professor and social welfare policy chair at the Touro College Graduate School of Social Work, there's a long tradition of a shared history of public health and social work about which many are unaware. "The progressive settlement houses, most notably Henry Street Settlement in New York and Hull House in Chicago, were the birthplaces of both social work and public health." In many ways, the driving force in the development of the settlement houses is the same as that which now largely fuels the increased need for, and attention to, public health social work—recognition of the social determinants of health. Then, as now, health disparities and lack of access resulting from economic inequity were key causes of illness and mortality. In these settings in the early 20th century, Salm Ward says, social workers "engaged in infectious disease control and maternal and child health promotion." While these pursuits remain a key focus for social workers, there are now many more problems directly and indirectly influencing health and wellness and demanding their attention. Additionally, in today's world, Salm Ward says, "global issues of terrorism, disasters, war, disease, viral outbreaks, climate change, oppression, health disparities, and social justice reinforce the need for transdisciplinary responses." Public health social work has a leading role to play in directly preventing and helping manage health issues such as diabetes, tobacco use, HIV/AIDS, suicide, and substance abuse, and in indirectly addressing these and other problems through advocacy for health care quality, broader access to care, and cross-sector cooperation. For example, "The aging of the baby boomers will require innovative collaboration as this population moves into retirement and has longer life expectancies," says Terry V. Shaw, PhD, MSW, MPH, director of the Ruth H. Young Center for Families and Children and an associate professor at the University of Maryland School of Social Work. Furthermore, he says, "issues related to affordable health and mental heath care, to poverty—living wages, segregation, service deserts—to immigration, violence, and child maltreatment are just a few of the issues that continue to plague our society and call for a more comprehensive, integrated approach." Alongside these issues and overlapping them, a trio of interrelated factors has influenced the growing interest in and need for well-trained public health social workers: the terrorist attack on 9/11, the implementation of the Affordable Care Act (ACA), and increased awareness of economic and health disparities. In the aftermath of 9/11 came a tragic wake-up call to public health professionals. "Prior to 9/11, I don't think many people gave too much thought to whether our public health infrastructure was able to respond to a national health crisis," says Robert H. Keefe, PhD, LMSW, ACSW, an associate professor in the School of Social Work at University at Buffalo, State University of New York. "As a result, the funding for public health services had been cut repeatedly in the years prior to 2001. Although the public certainly knew about various medical conditions such as asthma, chronic obstructive pulmonary disease, and posttraumatic stress disorder that can result from an environmental catastrophe, the fallout after 9/11 made us more aware of these health problems and how much we need a well-developed and responsive public health infrastructure." In the wake of 9/11, Keefe adds, "People were stunned by how quickly individuals living and working in the New York City area, particularly first responders, developed various health issues, most notably pulmonary problems, and how our public health service delivery system seemed to be slow to respond and not be fully aware of the extent of the problems that followed the catastrophe, despite public health social workers' advocacy efforts for healthy living and work environments. Thankfully, public health social workers and some public health organizations continued to pressure legislators for funding for a strong public health workforce, which includes public health social workers." The ACA has the potential to influence "social work to open up to wide-lens approaches such as prevention and public health social work," Ruth says. "It has a triple aim to better patient care, decrease the cost curve, and improve population health outcomes," she adds. Social work, Ruth says, has a role to play in each of these aims. Public health social work addresses in particular the population health goals of the ACA. Population health can only be improved through the use of prevention and public health measures. Thus, social work that focuses on population-level improvements is critical to the ACA's success. "Because the number of uninsured people in the U.S. had been growing steadily for many years, various catastrophic-oriented services such as emergency departments and urgent care centers were flooded with people seeking medical care who could be more easily and efficiently treated in lower-cost settings such as a physician's office," Keefe says. The ACA, he adds, recognizes what public health social workers have long advocated, "that prevention services are more cost-effective than catastrophic services." As a result of the ACA, individuals will have greater access to and greater likelihood to take advantage of preventive care. "The ACA calls for needs assessment and health care service provision at the community level—tasks that fit well within the skills of public health social workers," Salm Ward adds. And from a policy perspective, Zelnick says, "It supports new models for treating mental health and substance abuse in the health care system. Integrating primary care with behavioral health is a key focus of the ACA, and social workers have a big potential role to play in new service delivery models." This integration is important in two key ways, she says. "Including screening for substance abuse and mental health in the primary care context means that contacts with health services become potential starting points for intervening on problems before they progress and multiply. Equally important is making sure that people with mental health and substance abuse issues are also getting their other health care needs met." Zelnick points out that while there's a long history in this country of specializing in health care, there's also a history of separating physical health from mental and behavioral health. "In light of the fact that problems exacerbate one another, providers may not communicate over health care issues and needs, and lower-income people may face many barriers to health care access. These new models have potential to introduce more preventative interventions into our health care system, and this is good for public health." Julian Chow, PhD, a professor at the University of California, Berkeley School of Social Welfare, sees working on issues related to the ACA as one of the important potential areas of influence and practice for public health social workers. He observes that as more individuals are enrolled and have access to health insurance, a consequence may be a system that is overloaded by greater needs and demands and lacking resources to provide adequate care. Identifying resources becomes increasingly important. Social workers, he says, are trained to provide the crucial connections and link people in need to service providers within a community. They're instrumental, he says, in providing the essential interdisciplinary collaboration across sectors and in fostering a family- and community-centered approach. "We need to advocate for more resources so this safety net can be cast wider." "People interested in pursuing careers in public health social work, which has such a long history of promoting preventive services, now have an opportunity to work within communities around the country looking to develop preventive services," Keefe says. "Given that primary prevention helps people live longer and more fulfilling lives than other forms of prevention, the ACA will potentially help place new public health social workers in careers where they can have a positive effect on promoting health and well-being, not solely working to eliminate the negative effects that arise from a lack of heath care access," he says. Perhaps no issue contributes more than economic inequality to lack of access to health care or to the rising need for public health social work. "The data are conclusive that socially determined health disparities exist here and around the world," Zelnick says, adding that "racism, poverty, marginalization based on sexual/gender identity, and social isolation impact access to health care, health behaviors, and exposures in the workplace." According to Zelnick, "Inequalities and injustices are literally embodied and expressed as health problems, resulting in chronic disease; decreased mortality; community and workplace exposures; public health challenges intimately related to environmental factors such as obesity and poor food choices; violent communities; reduced exercise due to safety concerns; as well as infectious diseases such as HIV/AIDS and tuberculosis." Health inequality, Zelnick says, is a manifestation of economic inequality—the 99% vs. the 1%—"and an area where social workers are uniquely qualified to make a contribution to both primary and secondary prevention." Health inequities are preventable, Ruth says. "They reflect ongoing inequalities in society born of systematic disadvantaging of people based on gender, class, race, sexual orientation, immigration status, and more. As a profession concerned with social justice, health equity is a critical issue for us." She's quick to point out, however, that a narrow view focusing on treating one person at a time can't produce lasting change in a whole population. "Health equity requires systemic public health level approaches directed at impacting the social determinants of health—housing, income, access to health care, education, healthy food, clean water, and safe environments, to mention a few. Thus, our work to improve health equity must be directed at these really hard-to-reach issues. This means that we need social workers working at all levels of community practice including social advocacy and the building of a culture of health." Chow agrees that social workers have a key role to play in raising awareness of the social determinants of public health issues—whether gun violence, food deserts, suicide, alcoholism, or environmental justice—and advocating for more equitable access. Equally critical, he suggests, is becoming involved in research that looks at access and utilization, helping build bridges from policy-making to widening access to services, and facilitating cross-sector collaboration and connection. Zelnick also argues for the importance of political advocacy by public health social workers, pointing, for example, to efforts to expand Medicaid access. "The political decision by some states not to participate in Medicaid expansion is an enormous social justice issue; social workers should join any actions possible to demand that these decisions be changed," she says. "Ironically," she observes, "the states refusing to participate have some of the lowest Medicaid benefits and highest needs. At a time when federal social welfare actions have become unpopular, it's important for social workers to join with others to point out how these political actions violate human rights." Other groups, she adds, "such as transgendered people or undocumented immigrants, may also face barriers to health care access, and these are important dimensions of other social justice campaigns." Social workers are uniquely qualified to make a significant difference in public health. "With their person-in-environment orientation; their skill set that spans clinical, advocacy, policy, case management, community engagement, and community organizing; and their sensitivity to communication skills and cultural competence, they have great contributions to make to the social dimensions of public health," Zelnick says. The most pressing public health concerns are "persistent, long-standing, and widespread," Ward says. "They require a transdisciplinary problem-solving approach. Public health social workers, especially those who have earned an MSW and an MPH, can bring a transdisciplinary perspective to help understand and intervene to improve the heath and well-being of society." Public health social work, Salm Ward says, "blends the preventive aspect of public health and the problem solving orientation of social work. Social workers understand the need for tailoring interventions to specific populations; adopt a person-in-environment/family-centered perspective; and provide insight into the social conditions that negatively affect health and the social determinants of health." Social workers' social epidemiology perspective and bridge-building abilities, Keefe says, make them an invaluable asset to the field of public health. He points particularly to the organizational skills that allow them work well within systems as well as with individuals in various contexts, and to their ability to bring groups together to work on problems. "The knowledge, skills, and values of the two professions coalesce in public health social work," Salm Ward says, "and support contributions to research, policy analysis, program development, direct service provision, and administration." "Based on the ongoing challenges, I see demand for public health social work growing in the future," Ward says. In particular, I see students interested in pursuing formal training (MSW and MPH dual degree), and employers who are excited by the prospect of the broader skill sets these graduates bring to their organizations." These programs, she says, "provide interdisciplinary education in intervention at the individual, family, and group levels [social work] and prevention at the population level [public health]." As a director of an MSW/MPH program, Ruth believes dual programs provide the depth of knowledge needed for social workers to lead and excel in public health social work. "We need to make them less expensive and better fund those students willing to put in the extra time to become the leaders of this important area of practice. 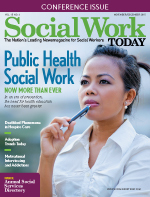 Moreover, MSW/MPH programs need to do a better job of promoting public health social work as a practice specialty." However, she acknowledges that MSW/MPH programs are both expensive and time-consuming; she believes the field must identify additional means of training social workers in public health skills. "Because many practicing social workers need public health training to work in the emerging areas of the new health system, she stresses the need for more continuing education in public health social work, prevention, and population health for social workers with MSWs. In addition, we need MSW programs to integrate public health and wide-lens coursework into their traditional health social courses, and perhaps expand to offer public health social work certificate programs." Prevention, Ruth concludes, is powerful. "Can you imagine what we could do if even 10% of social workers engaged in prevention?" she asks. She says, however, "We will only be powerful in our impact if we use public health science, work collaboratively across professions, market and rebrand ourselves as ready to do the latter, push past our hyper-focus on individual treatment, and measure outcomes." The occupational outlook, Ruth says, "will depend on whether social work awakens to its abilities and opportunities in public health social work, begins to expand itself beyond individually oriented interventions, and spreads into prevention and other areas of public health." Furthermore, she says, "opportunities for prevention and public health in general are highly dependent upon society's investment and funding." Ruth, who cofounded The Group for Public Health Social Work Initiatives, a working group affiliated with Boston University that aims to raise the profile of public health social work, sees public health social work's and the nation's progress as dependent on the ACA and the Obama administration emphasis on prevention. "Otherwise," she says, "we will not be able to rein in our health care costs, nor will we be successful in expanding social work opportunities in public health." Society, she observes, can't continue to cover the costs associated with treating chronic illnesses in a growing aging population, most of which, she adds, are preventable. Shaw sees public social work as coming full circle. "From the very beginning of social work in the United States, public health and social work have walked hand in hand, working to understand the issues faced by populations at risk, engaging the community on solutions, and then pushing for societal changes to ensure that the successes will be longstanding."